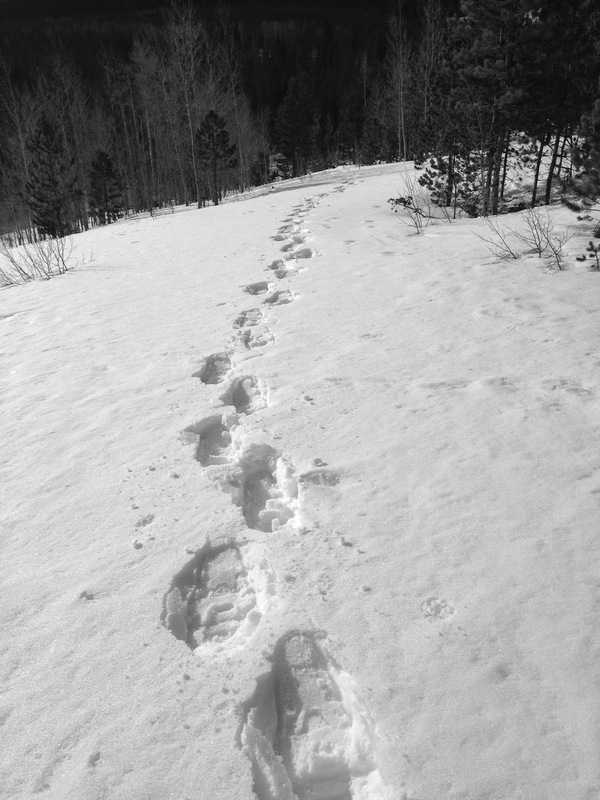 the tracks i made while snowshoeing last weekend. last september i told you about our $175/week challenge, where jeremy and i limited our weekly purchases in an attempt to stockpile money away for the future. it worked for a little while. it was really hard, but we were actually able to save quite a bit of cash! but then the holidays rolled around and... well, you know how that goes. - we didn't go overboard with christmas gifts for the boys this year (in my opinion). they each got a bicycle, a game, a book and a stocking filled with small things (like much needed underwear and socks). the bikes were a necessity, actually, as both boys had outgrown their old one. we would have purchased new models in the spring anyway so we decided to make that their christmas present, thus combining a "necessary" purchase with a "gift" purchase. and while the bikes were not cheap, we purposefully chose a less-expensive brand and ordered online instead of buying from the local bike shop, saving us about $250. - even though we were watching our spending we let the boys each choose one service/giving project for us to do as a family. harrison chose to support an 8-year old in uganda. we bought school supplies, hygiene products and a toy for a boy named calvin. we also wrote letters and included a picture of our family in hopes that calvin will write back to us. graham chose to buy toys for the jeffco action center, a local charitable organization. each of the boys used some of their own money to purchase the needed items. it was a fun, and very special, thing to do together during the holiday season. - jeremy and i discussed all the year-end expenditures that would be above and beyond our budget. thanksgiving dinner, teacher gifts, christmas presents, the start of the ski season including lessons for the boys and an increase in gas costs due to extra drives to the mountains, and TMI: i really needed a couple new bras!! ...all these things were planned. so, yes, we were spending more than our budget BUT it wasn't frivolous at least from the standpoint that we had calculated for them in advance. the holidays are over now and it's time to get back on track with the budget, which we are adjusting up to $200/week. we found $175 to be too strict for our family. frankly, i think $200 is still going to be difficult but we'll try it out for a while and see how it goes. - make a meal plan each week and stick to it. i don't bother too much with coupons or sales...just the simple act of planning out what we will eat each week saves us money. mostly by preventing last minute grocery store runs or, worse, trips through the drive-through. - do not go to target! do i need to explain this further? - along the same lines of StopGoingToTarget is this: i don't look at catalogs; they go straight into the recycle bin. i don't browse online. i immediately delete tempting emails that announce sales or deals. if i need something (like a new bra) i go purchase it but i do not go to the store to "look around". i discovered most of my shopping was ultimately to COMBAT BOREDOM and aren't there better things that could do that? like reading a book. or going for a walk. or playing a game with my children. or actually cleaning my house?? - i try to always remember our goal - we are saving for a down payment on a house! when faced with a spending decision i weigh it out against the idea of a new house. which do i want more? in fact, jeremy bought me a thoughtful, very expensive christmas gift and i did not open the box for more than a week because i was deciding how much i wanted/needed it. (jeremy was not offended by that). i really grappled...should we return it and save that money instead? 1) how do we fit personal training sessions for me into our budget? even though i quit going to my pilates classes in september in order to save $30/week it's become clear i do need some sort of fitness class...something to help me stay accountable in that area. pilates was $120/month. i've asked my trainer if he'd be willing to meet with me twice and provide workouts for me to do on my own the rest of the month. the cost of that is $100. less than pilates but still a significant amount to spend each month. we'll see how it goes. 2) how do we squeeze the cost of lunch for jeremy and the boys on skiing saturdays into the budget? lunch on the mountain is very costly. we've tried packing a brown bag lunch but that isn't something jeremy is interested in doing again. they burn A LOT of calories skiing and a sandwich doesn't cut it. the solution we are going to try this coming weekend is to make a soup or stew (something hot and filling) and pack it in thermos'. we did spend $75 on 3 thermos' - a pretty big investment! - but we've spent that amount for our family to eat lunch at the resort so we'll see if this thermos idea works out. if not, at least they can still use their thermos' to take a hot lunch to school and work. ultimately i did choose to open my christmas gift from jeremy. i'm typing this blog post on a beautiful macbook air, a luxury that was definitely not in the budget. * i think jeremy is secretly hoping i'll use this lovely laptop to write a book...a best-selling book...a book that will hit it so big he'll be able to retire! he's thinking more about rolling in the dough than shelling it out. like everything else, i guess we'll just have to see how that goes! so what about you? did you struggle with spending during the holiday season? do you find your shopping to be nothing more than a boredom-banishing activity? *it should be noted that although the laptop was outside the budget we could still afford to buy it. jer paid cash for it. we don't buy anything (inside or outside the budget) unless we can do so without going into debt.